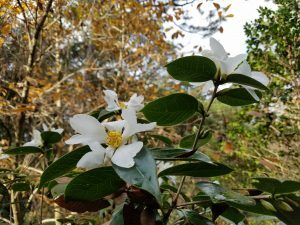 Camellia grijsii flowering in the Kosaku Sawada WinterGarden, with display label. I gave a tour to a group of visiting botanists a couple weeks ago. These were people who dealt mainly with the natural world, but can still appreciate gardens. 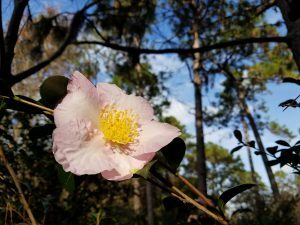 One of the ladies was reading a Camellia label in the WinterGarden and exclaimed, “Hey! That’s where I’m from in Georgia!” She beamed as one of the other scientists took her photo with the beautiful pink flowers. Visitors take a picture of the display label of Osmanthus heterophylla ‘Kaori Hime’ to remember the name of the plant they saw. Knowing and understanding the “origin” of a particular plant or cultivar helps put the plant into the wider context of the plant kingdom and of cultivation around the world. 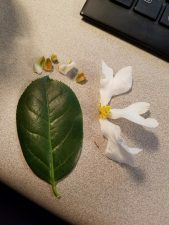 Think about it: looking at a tree and thinking ‘it’s just a tree,’ but suddenly you see it is from a specific region in China or was a cultivar developed in a town near where your family was from? That plant has just taken on a whole new meaning to you. 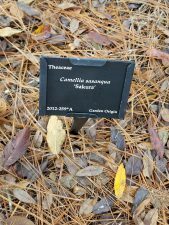 One of the most important things that sets a botanical garden apart from any other garden is the presence of labels telling you what plant you are looking at. 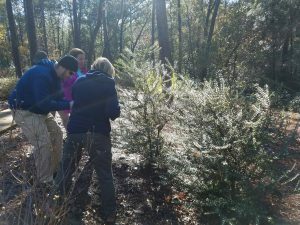 To have that, you need knowledgeable staff members who know plants, how to research them, and how to properly communicate that information to a broad audience, from laypeople to scientists. We are fortunate at the Mobile Botanical Gardens that we have a staff who can! 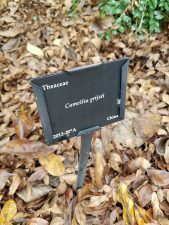 In the past, diligent volunteers did their best to make sure each plant was labeled with a metal tag and a label that could be seen from the path; however, this was not consistent throughout the Gardens. One of my jobs as curator of plant collections is to come back behind them, record the names in our master plant database, and then make sure the name is correct. After all of that, a newly formatted label is made. 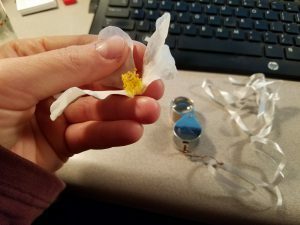 Dissecting the flowers of Camellia grijsii to determine whether it was properly identified. The new labels contain several pieces of information: the scientific name; the cultivar name (if it has one); a common name (if it is not a repeat of the scientific name); the plant family it is in; the accession number, which corresponds to its entry in the database; and then we’ll call it the “origin” information. Camellia sasanqua ‘Sakura’ was collected during a trip to Japan a few years ago. It was in cultivation there, but no one knows the details of its origin. It seems every time I walk through the Gardens with visitors, the question arises: “what does ‘Garden Origin’ mean?” The long and short of it is that it comes from a garden. It is just that simple, yet here is a lot of meaning packed into that little term. Really, it means that at one point in the history of horticulture, man came along and selected it from the wild or selectively bred it for the purpose of growing it in a garden. Which garden? How long ago? Where did it come from? Who selected it? Sometimes it is easy to know if there is a lot of literature about that particular group of plants or if it is a relatively recent development; but sometimes time has shrouded the origins in mystery and we may never know. For the sake of consistency and sanity, we choose to roll all of this simply into “Garden Origin”. Come visit us at the Gardens from Wednesday through Sunday, 9 a.m. to 4 p.m. Last entry is at 3 p.m., so come early! The Gardens are a private non-profit and rely on donations and entrance fees to survive. It is $5 for non-members, and free members and for children under 12. Join me for the monthly Walk with the Curator every second Thursday. The next walk is Thursday, January 11 at 10 a.m.